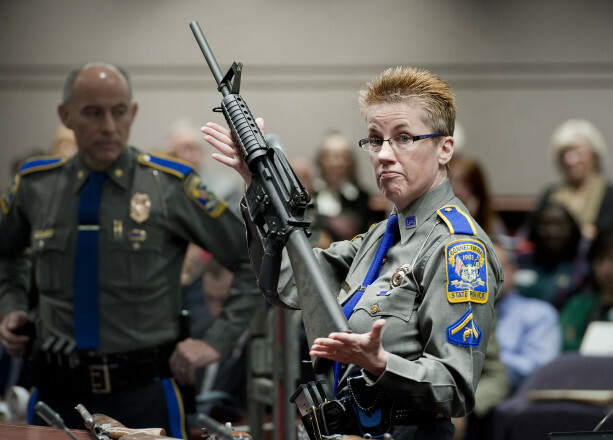 Connecticut State Police Detective Barbara J. Mattson holds a Bushmaster AR-15 rifle, the same make and model of gun used by Adam Lanza to fatally shoot 20 children and six school staff members at Sandy Hook Elementary School in December 2012. The legal complaint in the Newtown, Connecticut, gun lawsuit is a jarring read, juxtaposing sweet images of childhood with horrific violence. Paragraph by paragraph, it gives glimpses of the dead. Jesse Lewis, 6, an only child, loved riding horses. His last meal was an egg sandwich with hot chocolate. Dylan Hockley, 6, loved garlic bread and the moon. His favorite color was purple. Benjamin Wheeler, 6, wanted to be an architect, a paleontologist or a lighthouse keeper. The three died Dec. 14, 2012, when Adam Lanza opened fire inside Sandy Hook Elementary School. Filed in federal court in Connecticut in January, Soto et al. v. Bushmaster Firearms International, LLC is one of several lawsuits making their way through the court that seek money damages from gun shops and manufacturers. Other than heart-wrenching facts, these cases have something else in common: a steep uphill climb because of a decade-old federal law called the Protection of Lawful Commerce in Arms Act that gives the gun industry broad immunity. The legislation at the core of gun lawsuits is the Protection of Lawful Commerce in Arms Act. 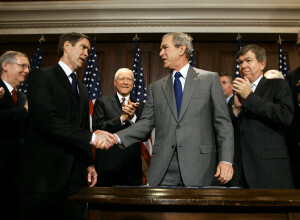 Signed into law by President George W. Bush in 2005, the law severely restricts civil lawsuits by crime victims against gun makers and sellers. It emerged after the gun industry challenged a series of setbacks. Among them: a suit in New York City claiming gun manufacturers and sellers had allowed their weapons to be sold in illegal markets, creating a public nuisance, and 2002 California legislation explicitly allowing suits against gun manufacturers. Beyond the back and forth over liability, the debate left an important policy question unanswered: If gun manufacturers and retailers are not held responsible, who pays when a mass shooting or another gun tragedy happens? In the wake of Newtown and other high-profile incidents, some have tried to change the law. In January 2013, Rep. Adam Schiff, D-Calif., introduced the Equal Access to Justice for Victims of Gun Violence Act, a bill aimed at narrowing the 2005 law’s scope by allowing suits when manufacturers, wholesalers and dealers are negligent. The law “denies the victims of gun violence and their families their day in court, and in doing so it protects the worst actors in the gun industry,” Schiff said. But those efforts have stalled. Congress initially passed the law with support from Republicans as well as Democrats in pro-gun states, and Schiff’s proposed legislation failed. The current law does include a few exceptions that allow gun manufacturers and retailers to be held liable. Among them: (1) when a manufacturer or seller knowingly falsifies federal or state records about the gun, (2) when a manufacturer or seller sells a gun to someone who they know is prohibited from having a gun, and (3) when a design defect directly results in property damage, physical injuries or death. The exceptions are the focus of lawsuits currently wending their way through courts, including in Connecticut, Wisconsin and Alaska. In December, two years after Adam Lanza walked into Sandy Hook Elementary School and opened fire, fatally shooting 20 children and six school staff members, the victims’ families announced plans to sue. The families say the gun maker and seller should have known that people unfit to operate the weapons would gain access to them. In particular, the families say, Bushmaster should have known of the “unreasonably high risk” that the rifle would be used in a mass shooting. Attorneys for the families did not return calls for comment. The National Shooting Sports Foundation, the trade association for the firearms industry – coincidentally located in Newtown – declined to comment on the lawsuit. The NRA did not respond to requests for comment on the suit or the legacy of the Protection of Lawful Commerce in Arms Act legislation. Albany Law School professor Timothy Lytton, an expert on tort law and the author of a book about gun litigation, said the Newtown case takes a different approach than many other gun suits. It focuses on negligent entrustment – the legal theory that it’s negligent to give a dangerous object to a person not able to handle the risk. Here’s what makes the case different: While other lawsuits have focused on problems with the sale of a gun, this one claims that by introducing the Bushmaster AR-15 gun into the marketplace, the manufacturer should be held liable. “This is the first time this question is being brought,” Lytton said. He declined to comment on the Newtown lawsuit’s chance for success, as did the Brady Center to Prevent Gun Violence, but other legal experts have raised doubts about the lawsuit’s chances of success. “It’s almost exactly the sort of claim that the legislation was designed to prevent,” said Nicholas Johnson, a law professor at Fordham University. Even if it fails in court, Johnson said, the lawsuit may have other benefits for those who lost loved ones in the Newtown shooting. In April, a Wisconsin jury is set to hear a gun lawsuit that managed to survive the limitations of the federal law. The case, Norberg et al. vs. Badger Guns Inc. et al., stems from injuries suffered by two Milwaukee police officers who were shot in 2009 by 18-year-old Julius Burton when they tried to pull him over for riding his bicycle on the sidewalk. The officers say the seller, Badger Guns, is liable because the store should have known it was illegal to sell the handgun to Burton, who was underage at the time. Burton walked into the gun store with his friend Jacob Collins, then 21. The lawsuit alleges the gun store should have realized Burton was the real buyer of the gun because Collins indicated on the purchase form that he was not the actual buyer. Lawyers for the gun shop argued that the Protection of Lawful Commerce in Arms Act protected the gun shop from liability in the case. His co-counsel, Jonathan Lowy – director of the Legal Action Project for the Brady Center to Prevent Gun Violence – has litigated cases against gun dealers and manufacturers for more than 17 years. He said the Wisconsin case is proof that federal law does not bar all lawsuits against gun manufacturers and sellers. The Protection of Lawful Commerce in Arms Act “is awful, but I spend very busy days litigating cases around the country which are not barred by PLCAA,” Lowy said. Badger Guns, the Milwaukee store, gained national notoriety in 2005 when federal data showed it was the nation’s top seller of guns linked to crimes – with 537 of its guns recovered by police. At the time, the store was registered as Badger Outdoors. Milwaukee County Circuit Judge Jeffrey Conen ruled in favor of the officers in January 2014, finding that the claim met one of the exceptions of the legislation, clearing the way for the upcoming trial. Lowy, the Brady Center lawyer in the Wisconsin case, also was supposed to be in trial Feb. 9, battling in a courtroom in Juneau, Alaska. But the night before his flight to Alaska, the court postponed the trial in a closely watched wrongful death lawsuit. In 2006, Simone Kim was fatally shot while painting a Juneau supermarket. Later, a drifter named Jason Coday was convicted in the killing. The Kim family filed a wrongful death suit, alleging that a gun dealer illegally sold Coday the gun without a proper background check. The lawsuit alleges that Coday went to Rayco Sales and walked out with the gun after putting $200 on the counter. “Essentially, you have a self-serve gun store,” Lowy said. The gun shop owner tells a different story. Ray Coxe said he talked about guns with Coday when he came into the store, but Coday wasn’t interested in buying a gun that day, said Coxe’s lawyer, Tony Sholty. Coday put on his backpack as if to leave, Sholty said, and Coxe walked away. It wasn’t until later that a gun shop employee saw $200 in cash on a counter, and Coxe realized that Coday had taken a gun, Sholty said. Coxe immediately got into his car and began to search for Coday, Sholty said. He says his client is not to blame. “Really, the bottom line is, did Jason Coday remove the gun with Mr. Coxe’s knowledge?” Sholty said. The case has been closely watched nationally. A trial judge dismissed it, ruling that the Protection of Lawful Commerce in Arms Act barred the claim. But the Alaska Supreme Court ruled the case could go forward, saying it was not barred if the gun was sold illegally without a background check – and sending it back to trial for a jury to decide. Abbie VanSickle can be reached at avansickle@revealnews.org. Follow her on Twitter: @AbbieVanSickle.